Is Laurent Brossoit the NHL's Best Backup Goalie? - The Point Data-driven hockey storytelling that gets right to the point. The Winnipeg Jets pulled out a 4-1 win last night against the Vegas Golden Knights, getting a bit of payback for being knocked out of the playoffs last year by Vegas. The win though wouldn’t have been possible without the play of Laurent Brossoit. 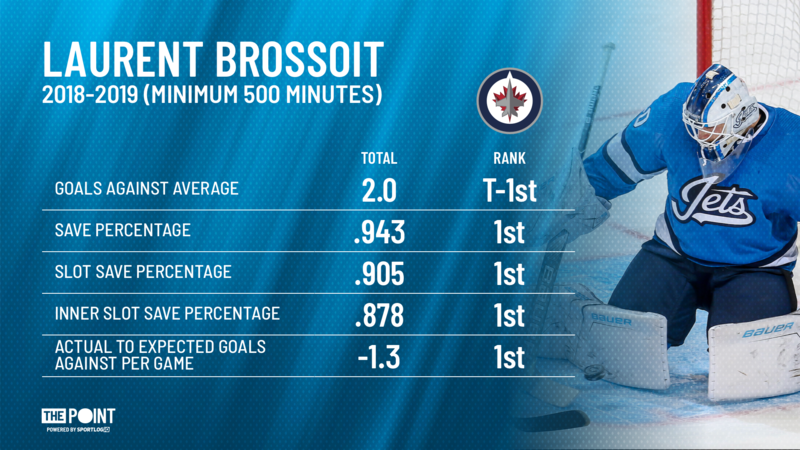 Brossoit is having an unbelievable year as the Jets backup goaltender. Brossoit has won 7 straight, bringing his overall record to 10-1-1 and when you consider that his one regulation loss came in relief of Connor Hellebuyck it paints a pretty impressive picture. Brossoit showed last night why he’s had such a good season. He was peppered with shots in the second period stopping all 26 shots Vegas threw at him, giving his team the confidence they needed to not only survive the period but come out of it up 2-0. Shots, of course, can be a bit deceiving depending on where the shots are coming from. In Brossoit’s case, he was shutting the door in the most important areas. Vegas put 21 shots on net from the slot and 6 from the highest danger area on the ice, the inner slot. This is nothing new for Brossoit who’s played this way all season. He leads the league in a number of important statistical categories this year. Brossoit is not just leading the league in save percentage but he’s also leading the league in save percentage from the most dangerous scoring areas on the ice. What really stands out though is his actual to expected goals against number. At -1.27, Brossoit is saving on average 1.27 goals every game he plays in. That’s a full goal more than Hellebuyck’s -0.26. 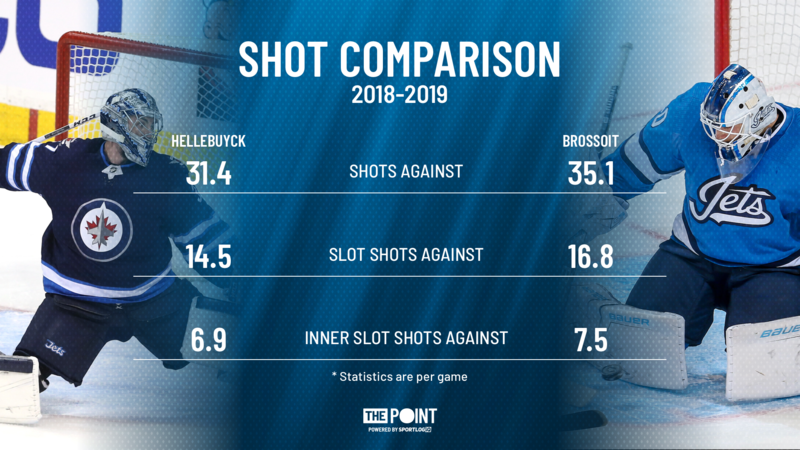 An obvious argument to his play is that as the backup he’s facing much easier opponents but that loses traction pretty quickly when you consider the types of shots he’s faced compared to Hellebuyck. The Jets are in an enviable position where they have two great goalies they’ll be able to rely on when they try to build on last years playoff run to the Western Conference Finals. 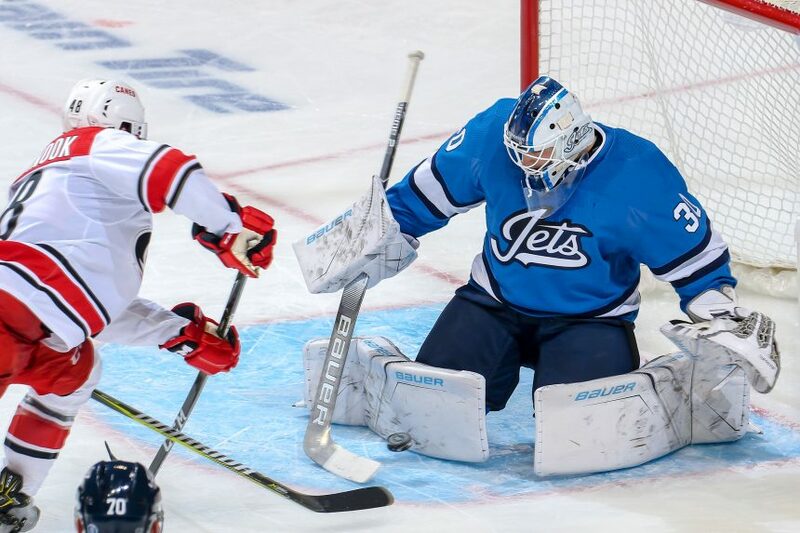 Brossoit hasn’t played enough games for there to be a goalie controversy here but the Jets should definitely feel comfortable giving him a greater share of games to keep Hellebuyck rested for the playoffs.